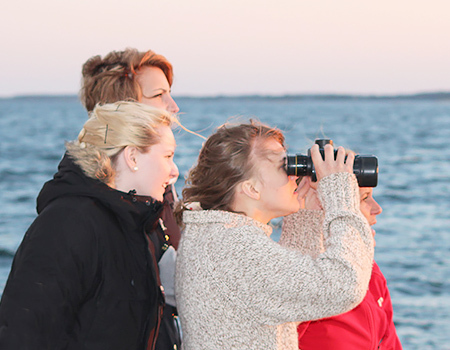 The Seal Safari must be pre-booked and paid at the Dalskär Camping. The camping is very close to the Bergkvara Marina, where the boat trips start. July 8-August 10, Mondays, Tuesdays, Wednesdays and Saturdays. Time: From Bergkvara Marina at 8.30 am. Cruise from Bergkvara marina towards Djursvik. Keep a lookout for seals! It’s a good idea to bring bino­culars. Bring a picnic – we make a snack break. Total time is approximately 1.5 hours. Max 12 persons. Life Jacket on board. Times are subject to change dependent upon unforeseen weather conditions.